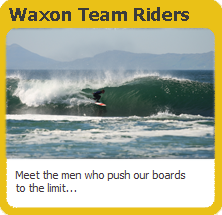 WaxOn Surfboards Ireland design and shape custom surfboards. Conor and the WaxOn Team work with you to design, shape and create a surfboard to your individual specifications. Come and visit us in our workshop in Rathcormac, Co. Sligo on the Bundoran road, and see your board through all the development stages, from a foam blank to the finished product. Or how about going one better, if you see someone on our boards - ask them about it and how they like it - we're happy to let our boards speak for themselves.